Dunsters Farm scoops top award! 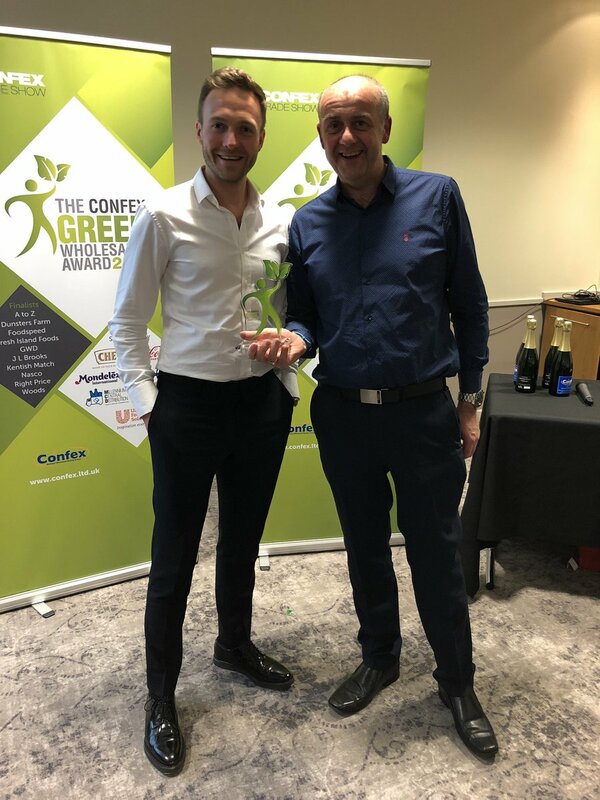 We are delighted to announce that Dunsters Farm was announced the winner of “Best Green Wholesaler in Foodservice Sector” at last night’s (10 April) Confex Members Dinner. Following our nomination last year, Tom and Norm attended the ceremony in the Cotswolds and were thrilled to accept the award on behalf of the Dunsters Farm team. The judges of the Best Green Wholesaler Award are looking for food service companies across the UK who evidence a commitment to energy saving, waste management, efficient transportation and social awareness. We are delighted to have been recognised as an example of best practice within the food service sector. Dunsters Farm has worked hard over the last few years to focus on how we can fulfil our environmental responsibility. For example, we have upgraded our lighting throughout the depot to low energy LED lighting. Additionally, we have reviewed our energy supply and currently work with Orsted, a Danish energy company, who use offshore wind farms to provide renewable energy to our site at Waterfold Farm. Furthermore, we are proud that our own label water is produced at the only facility in the UK soft drinks industry that is fully operated from green energy produced on site using solar panels and wind turbines. Staff have been working hard to reduce the amount of waste produced on a day to day basis; emailing rather than printing wherever possible and printing double sided and in black and white are just some ways in which this has been done. A key example here has been the introduction of the voice pick system, allowing us to save a massive 84,000 sheets of paper per year! Our warehouse team have also been busy looking to re-sell products where the packaging has been damaged at discounted prices and working with local charities such as The Real Junk Food Project Manchester and Sandwich Angels to ensure our inevitable food waste goes to good use. We are also proud to have been able to donate a piece of land to the Life for Life charity who have created an amazing memorial forest where people can plant trees in remembrance of their loved ones. The money raised is then donated back to local hospices and other healthcare organisations. Further examples of our efforts to reuse and recycle can be seen with by our commitment to the pallet return scheme. Any pallets that are not part of the return scheme are collected and either upcycled or recycled. The warehouse team are experts at recycling cardboard and shrink wrap, all of which is segregated and collected regularly. The use of vehicles is essential for the business, however we have invested heavily in software to ensure fuel efficiency and monitor key indicators such as idling. We backhaul from six suppliers currently, avoiding vehicles returning empty and saving another vehicle being put on the road unnecessarily. Our fleet of delivery vehicles are all Euro 5 engine powered and use Ad Blue to reduce harmful emissions. Our sales team look to reduce business travel where they can and make good use of the remote server we invested in five years ago to allow them to work remotely, reducing the need to travel into the office on a daily basis. We are registered for the Cycle2Work scheme, a number of staff walk or use public transport to travel to and from work and we have three electric vehicles within our fleet. Over the past 12 months Dunsters Farm has introduced an environmentally friendly non-food range and are proud to work with suppliers who value sustainability and work to reduce the impact of their manufacturing processes on the environment. At our recent quarterly management meeting, we set out our objectives for 2019/20 and we will continue to focus on ways we can reduce our environmental impact. To demonstrate our commitment, we will be working towards achieving ISO4001 standard. Furthermore, we are testing the use of Electronic Proof of Delivery Systems to replace paper based delivery notes and we are looking at the possibility of replacing our refrigerant to a lower GWP gas. Within the depot, we are keen to enhance our recycling processes and further reduce our waste over the coming 12 months. Thank you to everyone for playing their part – we are delighted to have been named “Best Green Wholesaler in Foodservice Sector” and are looking forward to continuing to evidence our commitment to our environment in the days and months to come.